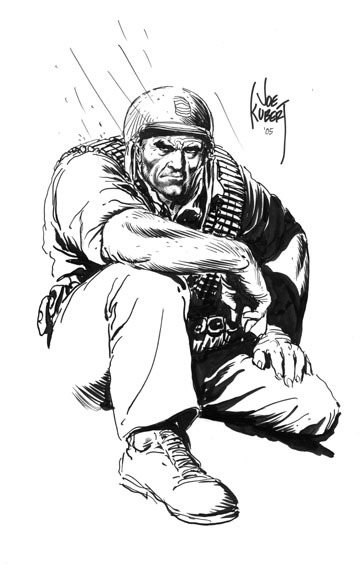 Legendary comic book artist Joe Kubert has died at the age of 85. Reliable source confirms that Joe Kubert had been in hospital and has passed away. So sorry to hear this. A great artist and a great man. Kubert was especially well known for his prolific Hawkman and Sgt. Rock artwork for DC Comics. But not just an artist, Kubert was also renowned as an educator. He founded The Joe Kubert School of Cartoon & Graphic Art in the mid ’70s, which was recently renamed The Kubert School. Countless artists have gone through the program — two of the most famous being his sons, Adam and Andy. “He was one of the seminal artists of the modern comics era, going back better than 40 years,” said writer Chris Claremont. “He was a good teacher and a gentleman and while I never got the chance to work with him, it was a pleasure to enjoy his work. Rest in peace, Joe. You will indeed be missed.